Spice up your next picnic, holiday potluck, or upcoming wedding reception with the Rustic Elegance set. 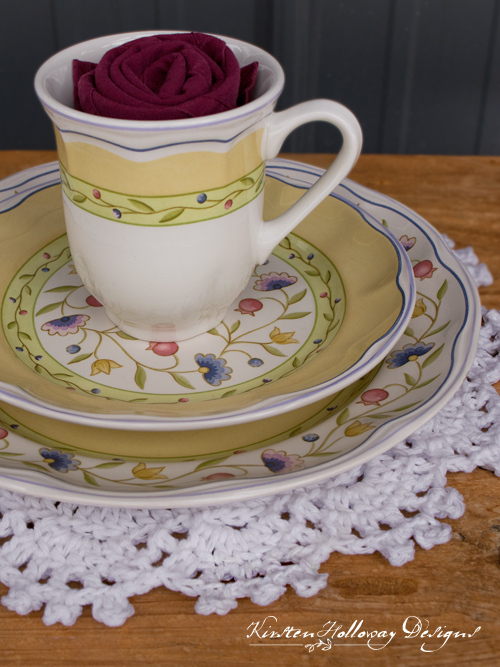 There is a smaller coaster for cups, and a slightly bigger doily for setting candy or sauce dishes on. 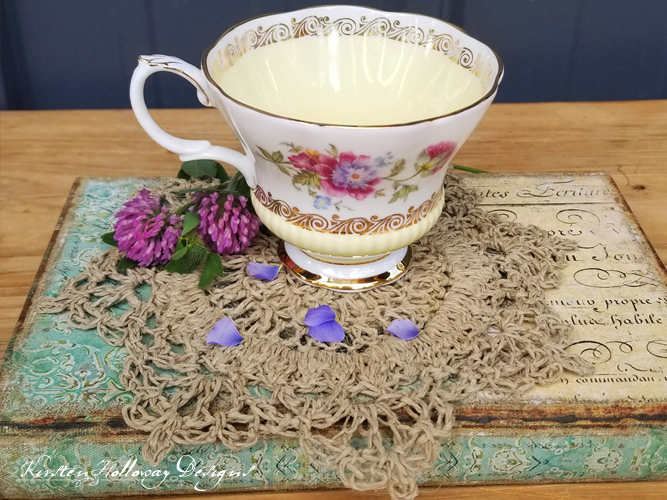 Crocheting with other materials has become somewhat of a fascination for me, and this doily set is the result of some recent experimentation with hemp cord. These coasters are quick to make, and use only a small amount of hemp each. This is DIY home decor at it’s finest and most elegant! 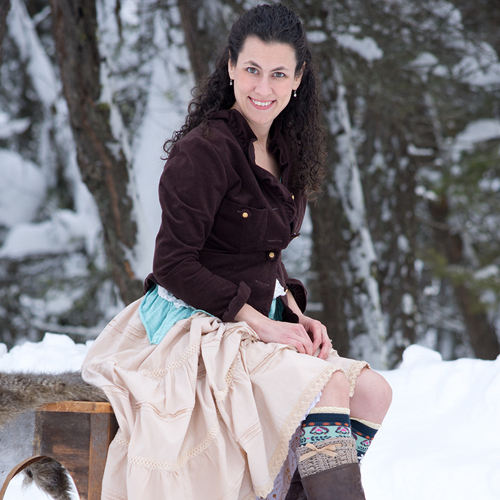 Click here to add this set to your Ravelry queue! 4dc cluster: this is basically a “dc4tog” in the same stitch: yo, pull up a loop, pull through two loops leaving 2 loops on your hook, yo, pull up a loop, pull through 2 loops leaving 3 loops on your hook, yo, pull up a loop, pull through 2 loops leaving 4 loops on your hook, yo, pull up a loop, pull through 2 loops leaving 5 loops on your hook yo, then pull through all 5 loops. –Blocking is very important for these. They will not lay flat if you do not block! -I ended up crocheting with a little more tension than I usually do to keep my stitches even. -The hemp cord is not uniform in thickness so I tightened up for the thicker parts of the cord, and loosened tension for the thinner parts. -If you find the cord is hurting your hands you may be using too much tension. Note: Your doily will be kind of floppy at this point. Don’t worry, we’ll fix this with blocking at the end of the project. Wet the doily down, pat with a towel to remove excess water. Lay doily on a flat, hard, surface, then shape the points. Place something heavy on top, and let dry. It was good to see you! Thank you for visiting! You are welcome to share the link to this pattern, using one image of your choice, on your site, but please do not share the written patterns themselves, or use additional images. Thank you! 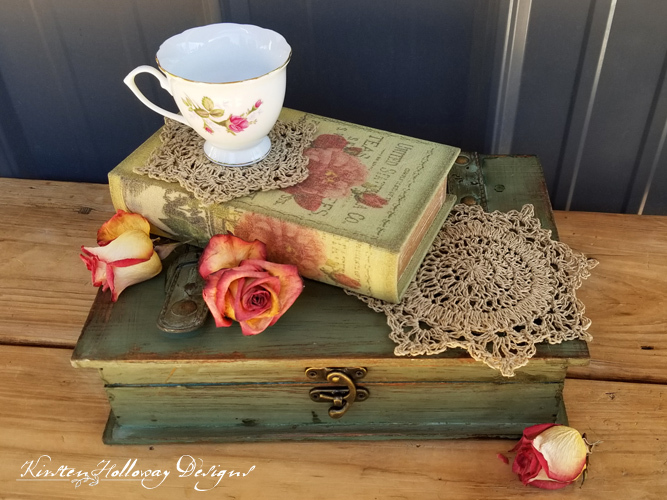 The Rustic Elegance coaster set was made to be used by individuals, and small business crocheters alike. Selling your finished pieces in boutiques, at farmer’s markets, craft shows and other events is encouraged! The only thing I require is that it not be used commercially to produce millions of copies. This pattern is absolutely stunning!!! Thank you so very much for sharing it with us!!!! Thank you, Judy! I’m so glad you like it! Awesome patterns is hemp like jute that we used to use ages ago? but hemp is way stronger for a natural fiber…. Can a person use size 10 thread for this project? I don’t know how it would turn out with #10 thread since I only tested it in hemp. You are welcome to try though! I’m trying to make the coaster, and I’m having a difficulty in Round 2. You say you should end up with 24 stitches, but the way I’m reading it (1 4dc cluster = 1 stitch / ch1, skip a stitch = 1 stitch ), I still wind up with 12 stitches. Oops! There should be no skipped stitch! I’ll fix that right now! These coasters are beautiful! I do not block though. I think I am going to try with cotton yarn.